This is a question we get asked a lot of. Firstly, did you know that there are about 100 different forms of arthritis and arthritis related diseases? 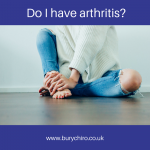 Whilst OA is the mechanical wearing down of the joints, RA is an autoimmune disease where the body incorrectly attacks its own body tissues, including the cartilage between the bones. If your joint pain is at its worse in the morning and you suffer bouts of severe fatigue, then we would ask your GP for a blood test to check for RA. Fibromyalgia is something we are helping with more and more these days. Fibromyalgia has a long list of symptoms, including fatigue with muscle and joint pains and these symptoms can come and go with stress being a common trigger. Psoriatic Arthritis is similar to RA in that it too is an autoimmune disease, the body attacks itself. In PsA it is the connective tissues such as the tendons and ligaments which become effected, as well as in some cases causing skin complaints ( Psoriasis ). Well it all depends on what type of arthritis you have. So the first port of call would be your GP. Depending on your symptoms your GP may refer you for X-rays or they may then refer you to a specialist such as a Rheumatologist. They may even prescribe you more painkillers, anti inflammatories and in some cases steroids. and registered Chiropractors is an extremely effective and safe way of having your spine, pelvis, hips and knees realigned, thus reducing pressure build up in your achy joints. In many cases slowing down and in some cases, the repairing of joints effected by OA, is possible with a course of appropriate Chiropractic care. Chiropractic care may not be able to reverse the cause of RA/PsA and Fibromyalgia but appropriate care, can in most cases ease some of the symptoms and in our opinion, should be considered as an option for those looking for a way to manage these conditions. A body with both a well aligned spine and joints functions better than one that doesn’t. Chiropractic is well placed to steer your body back to health. 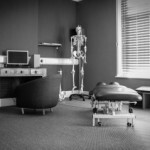 I’m a passionate Chiropractor, I love what I do but there are other options including physiotherapy, dietetics, massage, osteopathy and orthotics. Some of our patients have had success with all of these and we do offer a selection of different approaches to ensure that you receive the best care. If you are unsure what to do, come and see us and we will guide you through it. There is help out there for arthritis that doesn’t need to only involve taking pain killers, steroids and anti inflammatories. please feel free to share with your friends/family and social media groups.